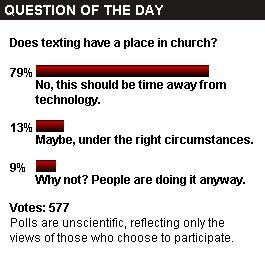 It was reported that the Pastor of Morning Star Church apparently encourages the use of cellular phones during the worship service to text him questions about the sermon. From what the poll that the St. Louis Post dropped into the article, it appears most people think this is bad thing. In any case, at least Rev. Mark Evans gets a thumbs up for being brave enough (and trusting enough of his congregation) to try it. Even more bonus points if he really does manage to weave the questions and comments that he receives into his sermon in real-time. Wow. This isn’t hard to believe though… forward thinking can be a good thing. Last summer I preached a series and I gave the opportunity for people to text me during the messages. I made sure I had enough time at the end of the sermon to view the text messages and answer any relevant questions (I didn't address each text message as they came in – just at the end). It was a great way to keep people involved. I received LOTS of positive feedback for this, and really no negative feedback. My ministry context: I'm on the pastoral team of a mid-west, conservative, Evangelical church. The days of strict oral communication (non-interactive, where one teaches and the rest receive) are fading. More and more people process information by contributing and being involved, and not just through receiving. It's how people learn now, and how many schools are structuring learning environments. I don’t think our pastor has asked from the pulpit for texts, but they do encourage tweeting, which my wife and I do a lot as well as many others. It’s often us sharing things about the service. I think it does some good if there is time to respond, i.e. the pastor can read them while a few songs are playing and can answer them at the end of the service. During a lot of our youth conferences we have had students tweeting questions or their thoughts on the conference or how God was moving in their life that weekend…it was cool to see those responses up on the big screen while we waited for the large group meetings to start.